Our clients are a couple age 63 and 59 with two adult children. The husband is a corporate executive in business development/sales for a technology company and his wife works part time for a non-profit organization. When we started working together, they said they would like to retire in 2 to 3 years and maintain their current lifestyle, but were not sure if they would financially be able to do so. They had a financial advisor/broker that helped them invest in a diversified mutual fund portfolio along with a variable annuity which they later regretted purchasing. Now that they were starting to seriously consider retirement, they wanted to consult with an objective fee-only Certified Financial Planner™ professional to help them plan for retirement. They also wanted a detailed review of their current investments which included his 401(k), a joint account, IRAs, Roth IRAs, company stock, and a variable annuity. At our first meeting we talked specifically about when they would each like to retire, and about the type of lifestyle they would like to have in retirement, both in their early years as well as later on. We discovered that they had not done any estate planning and did not have a will, trust, or advanced health directives. We looked holistically at their overall investment portfolio and noticed that their portfolio was over diversified among similar funds throughout their various accounts. As a result their investment returns were mediocre and they were taking significantly more risk than realized. This left them very exposed to market risk which could delay their retirement or require them to go back to work after retirement. We helped them set up a living trust with the help of an attorney. We discussed potential cost of long term care expenses later in life, and mapped out ways to address those concerns. Since their retirement date depended largely on their financial ability to comfortably maintain their current lifestyle, we prepared a retirement plan with detailed cash flow projections. This way they were able to better understand the impact of retiring at different times. We worked with them to create a tax efficient investment strategy that best utilized investments available to them in their 401k and variable annuity, and employed our active strategies in brokerage accounts which significantly reduced the risk of a large decline in their overall portfolio that could delay their retirement. Our clients felt much more organized and in control over their future after their work with us. They have both now recently retired. We are in frequent communication and see them in person twice a year to review their investment portfolio. They also call us whenever they need help or have a question about a financial decision, since they know they can do that for no additional cost. This case study is hypothetical in nature and not specific to an actual client. The material is intended for illustrative purposes and not meant to be advice. 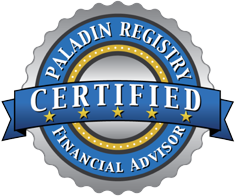 Schedule your free financial review today.